We’re heading to the Washington coast for a few days. 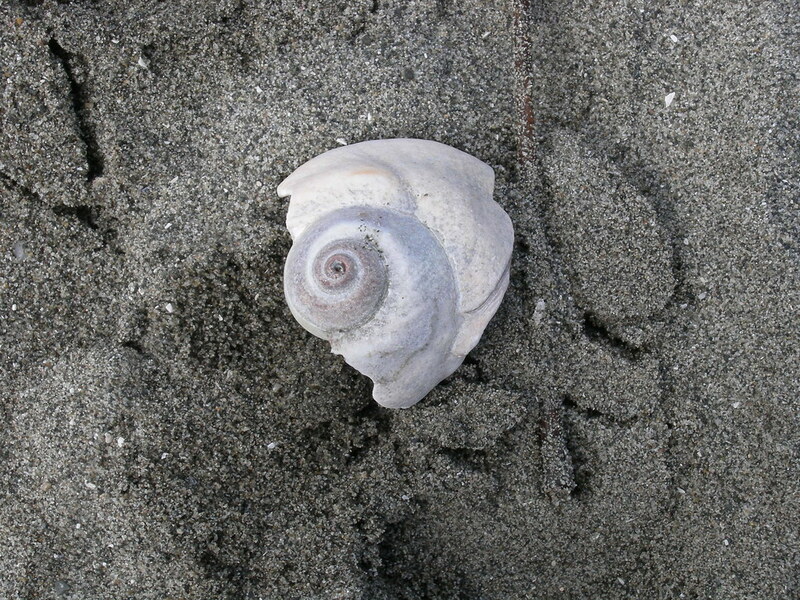 My family nearly always went there for spring break when I was growing up – I remember it as wild and stormy, often soggy, occasionally boring and mostly magical. Now I am passing along this tradition to my daughter, I hope she enjoys it and isn’t too jealous of her friends who are heading off to warmer climes. I’m debating about whether or not to take a laptop – it would be kind of nice to have a few days’ break from the 24 hr. news cycle and I know it would be hard to resist the temptation to spend half of the vacation looking at garden blogs. Then again, I hate to get too behind, it’s hard to catch up! Nobody likes a “portable” classroom, basically a stopgap measure for school over-crowding that amputates the kids and their teachers from the body of the school as a whole. It can be an isolating and disconnecting experience foisted upon a school by a cash-strapped district such as Seattle’s, which can’t find enough money to balance the budget this year without closing schools and cutting staff. At my daughter’s school, an extra class “bubble” got added last year and there simply weren’t enough rooms left in the school to house them. So, the portable which had housed the music program was re-purposed as a 4th grade classroom and the school had to decide how to help the students there feel really a part of the whole. Happily, parents and staff worked hard to secure grant money and donations to transform this space into a “green” classroom, and the kids and their families are putting in a lot of sweat equity to make it happen. 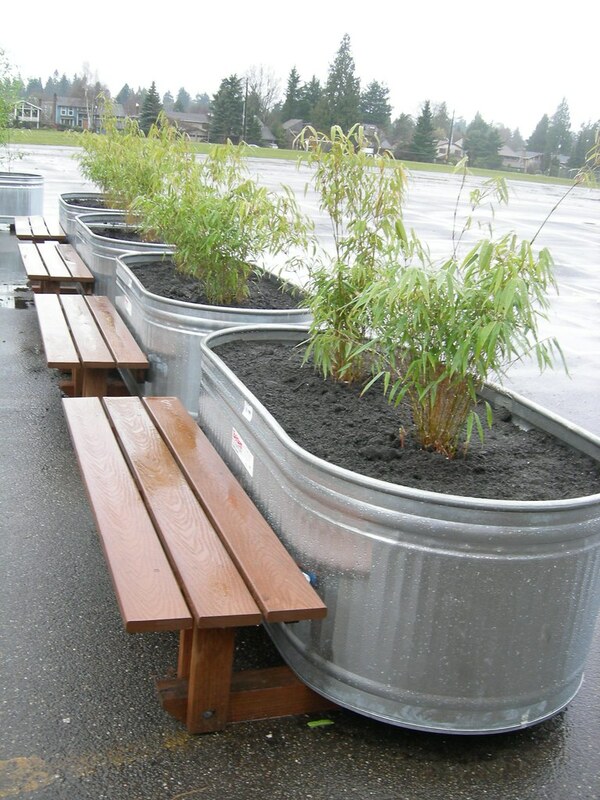 One major project has been the addition of a bamboo garden to screen the exposed outbuilding, provide shade and help mitigate pollution caused by fume-belching school buses and other vehicles. 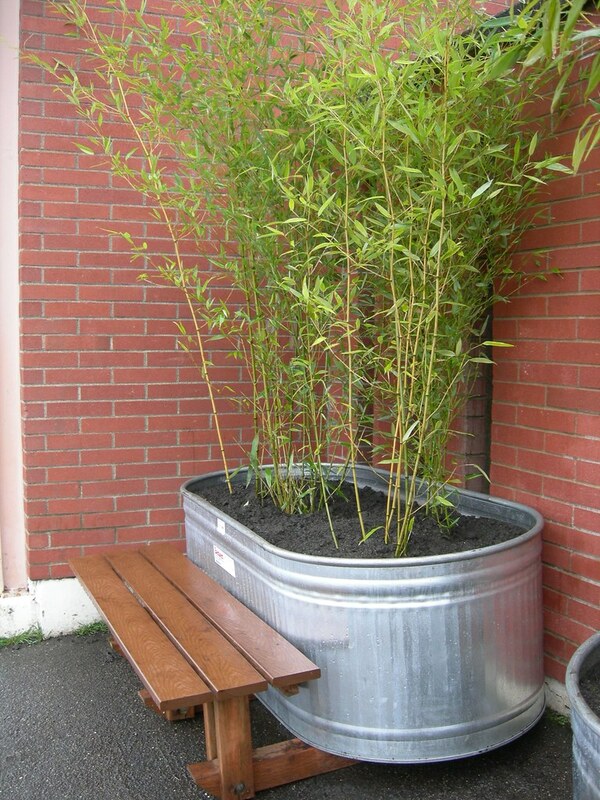 This ties in directly with the class’s overall theme of study this year, Bamboo and Sustainable Resources. Back in the fall, the kids visited Boo-Shoot Gardens bamboo nursery in Mt. 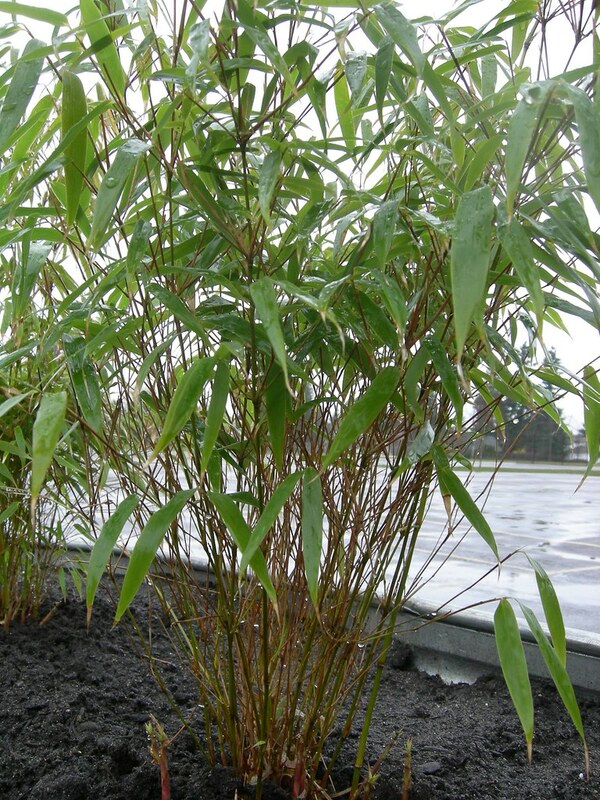 Vernon, WA, to learn about bamboo, perform tissue cultures, and come home with their very own bamboo plants. Boo-Shoot generously donated further plants for the school garden. For weeks, the bamboo garden (which had to be made on top of existing playground blacktop) has been taking shape. 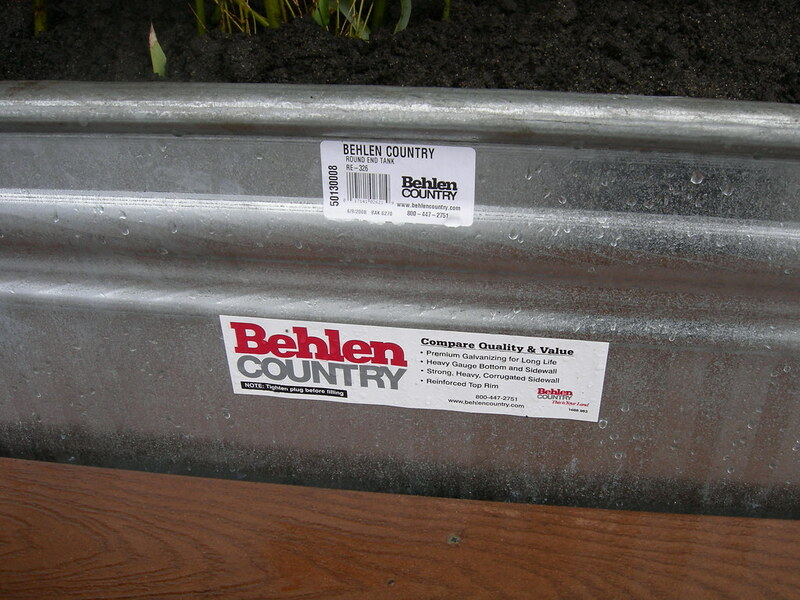 First, the galvanized stock tanks were delivered. Then, a giant pile of manure-rich soil/compost was delivered (and classroom ambassadors visited the younger grades to respectfully request they not play in it, for obvious reasons). Finally, the tanks were laid out and plastic wood benches (with bases that raise the tanks up off the ground to allow drainage) were attached. Finally, soil added, the bamboo arrived and students and volunteers planted several varieties this past week. I was there just as they were finishing up (sans camera, alas) – the look of pride on their faces was priceless. Their singing teacher came out with her guitar and they consecrated the garden with a few songs. It was truly inspiring. When you sit on the bench and breeze comes along, you can close your eyes and feel that you are in the high mountains of China, watching for a panda to come along. 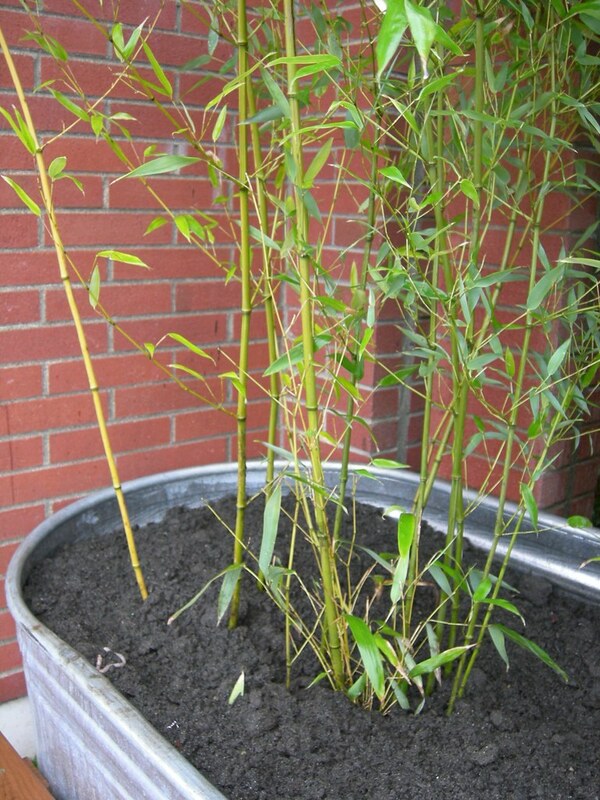 Yellowish culms of Bissets bamboo (Phyllostachys bissetii), a running type so good thing it’s in a container, will eventually turn greener as they mature. Another variety with very skinny culms, for now at least. The plant tags had been removed, so I’m sorry that I don’t know what this one is. I am so happy that our school places such a high value on community and earth stewardship in addition to the three R’s. I hope other schools will encourage their kids to take up shovels and dig in the dirt a little bit. Maybe the class that is helping out in the White House garden will help to inspire more school gardening projects around the nation and the world! I know that over-wintering veggies and other edibles is a science. Someday, maybe I’ll bother to study it and then I won’t find myself wondering in the spring why I bothered. 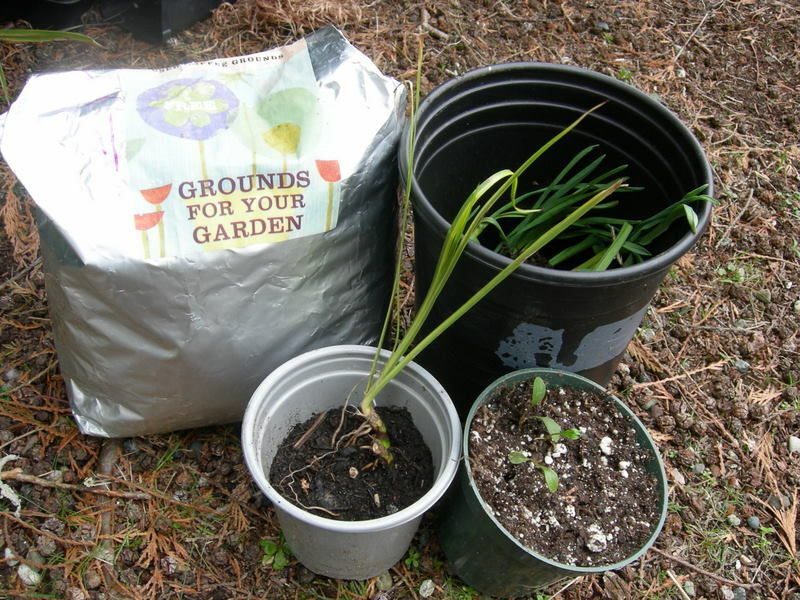 My tendency is to buy starts in the fall or plant a few seeds, plunk them in the ground on the late side, and then watch it all sit there and do nothing all winter. 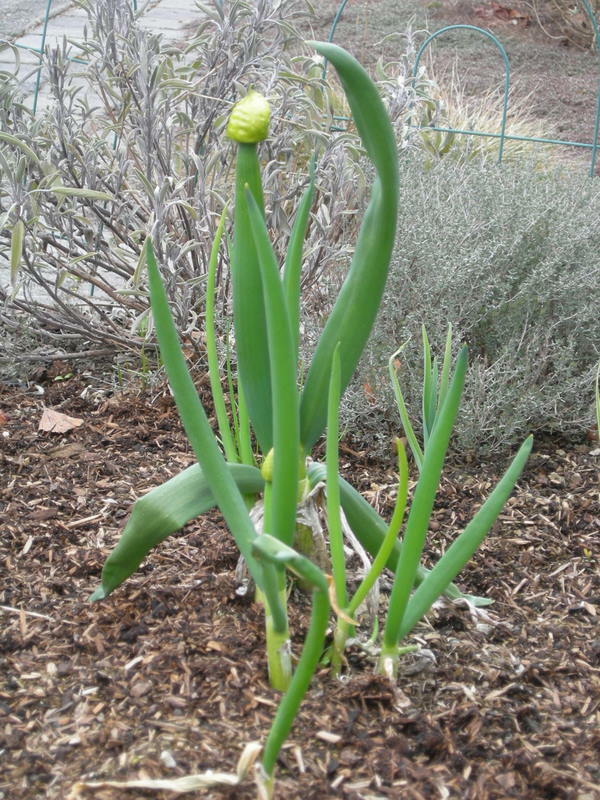 Then, in the early spring, I spread some mulch, the temps start to warm up, things take off a bit, and then… most of it bolts during the two days I don’t bother to look at the garden. 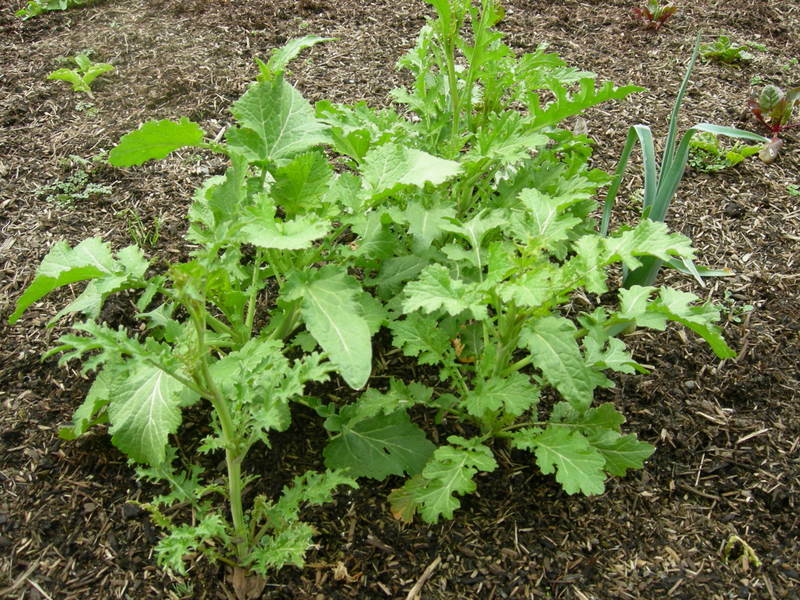 Chinese mustard, probably on the spicy side when it was tiny – now it would probably singe our tongues off. Might have to look up recipes (alchemies?) for milder-izing it so it doesn’t end up being a total waste. A plus – the slugs ignored it entirely! Undoubtedly too spicy for them too. 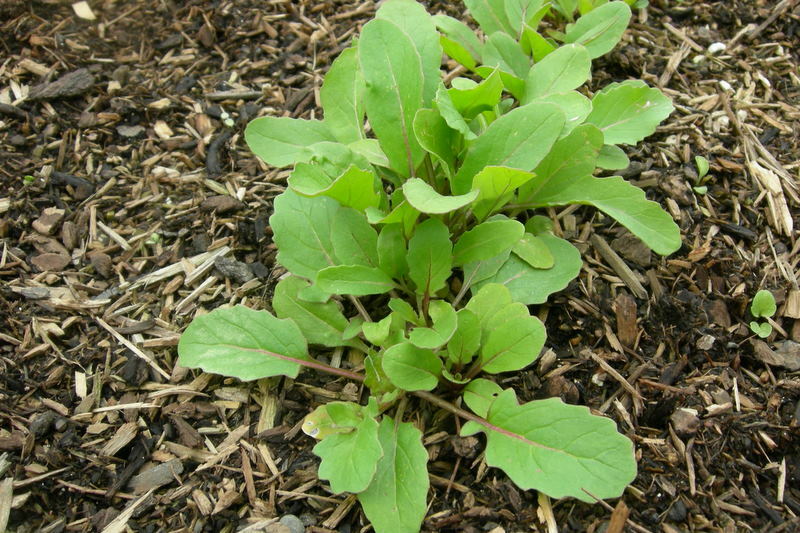 Mesclun mix, probably one from Seeds of Change. Slowly, slowly… I think these might be salad-worthy in a couple of weeks. Russian kale, starting to get a little bigger. Not sure what the ideal leaf length is for a good tasting harvest – I’ll have to hunt around for opinions, or please feel free to offer them here. I need recipes for this one too, but have also enjoyed it as an ornamental if nothing more, the filigreed leaf edges and delicate lavender ribs really get me. I’m going to straight up admit that I just don’t get how to grow onions of any sort. I am too much of a numbskull to keep track of when they are to be planted and harvested, since it seems off from the rest of the garden. These might have been shallots at some point, they’re probably just compost now. Well, I’ll dig down and see what’s there. Maybe I’ll get a pleasant surprise. Arugula, my favorite green and my one and only never-fail crop. Just put the seeds in whenever, it seems happy in any of my challenged gardens. A squirrel dug up half of the row and I never got around to re-planting it, but it has the best germination rate of any seed I’ve ever grown, no matter what company I get it from. If it’s all I grew, I would feel pretty invincible! 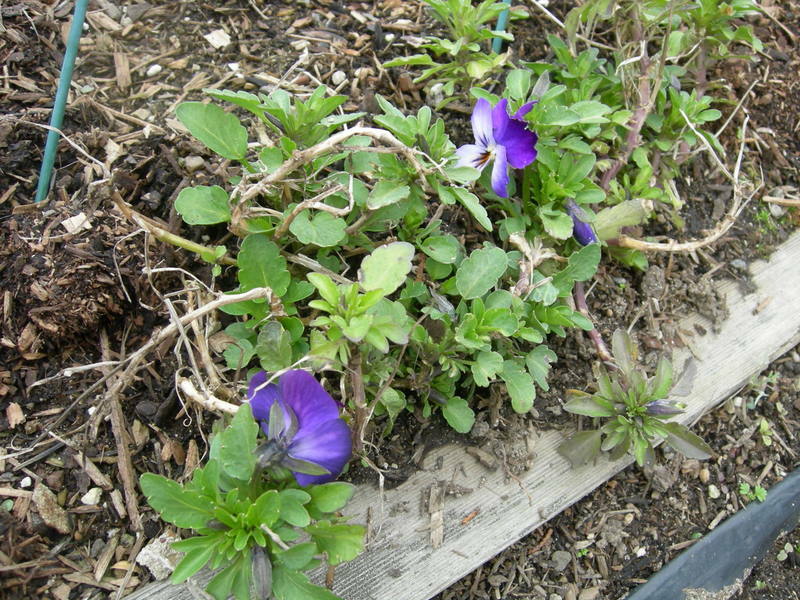 First volunteer flowers of the season, my trusty violas. Last year it was ‘Ultima Morpho’ that was everywhere, but this one I can’t name and it has been popping up in the parking strip. I don’t usually bother to plant seeds or get starts of these anymore, they seem happy to keep coming back and I (almost) never say no to a free plant. I had what I thought was a fun idea back in the fall, to plant ‘Bright Lights’ chard starts in a circle at the center of the veggie garden. They would grow tall, I would let them look really sculptural for a while until the peas needed to go in, all would be groovy. Well, between the squirrels rearranging the starts and killing a few, the snows that crushed the smaller plants, and now the cold spring we’ve been having so far, I’m afraid it’s time to pull out these sad little plants that never grew. I’m not going to show a picture, it’s just too pathetic. 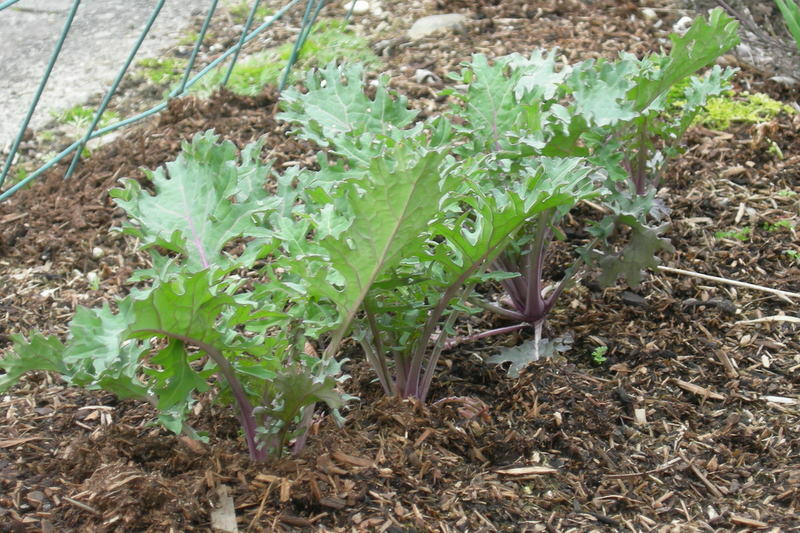 What is your experience with over-wintering your veggie garden? 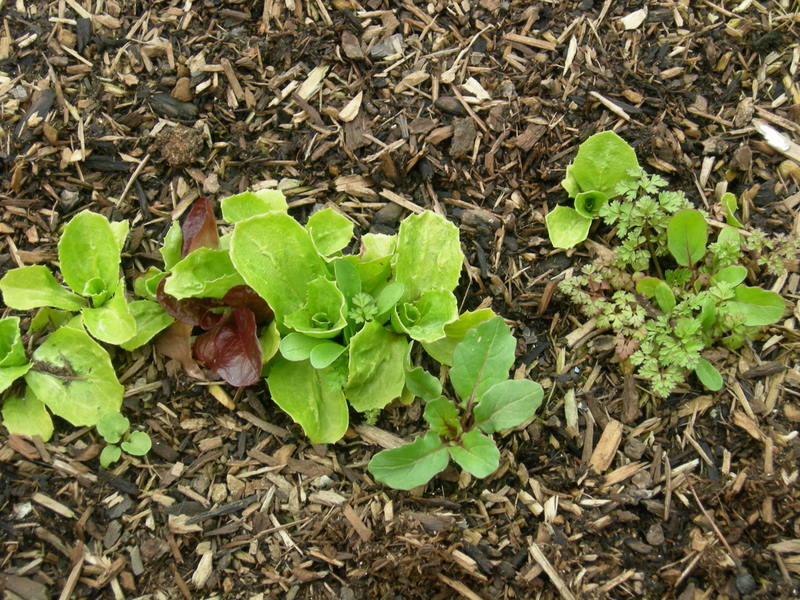 Do you plant it up or let it rest? Put in a cover crop or use a cloche? I want to do it better next year or not at all! Ah, spring! 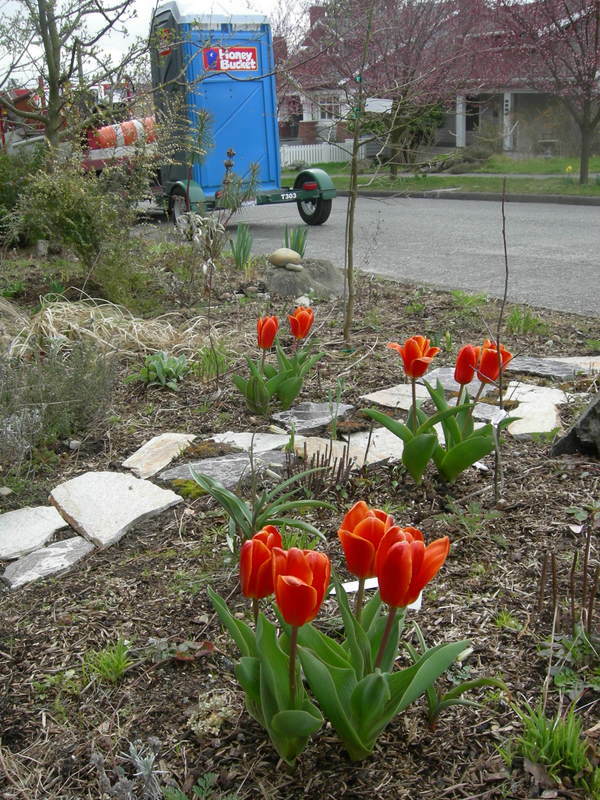 Out in my parking strip garden, I can see the lovely sights of bulbs blooming, birds flitting around, perennials awakening from their long winter nap, and to top it all off… a port-a-potty for the construction crew that’s been jack-hammering up a storm down the street. Don’t you just love that name, Honey Bucket? Luckily, they moved it later in the day. I like this view a lot better, sans sanican. 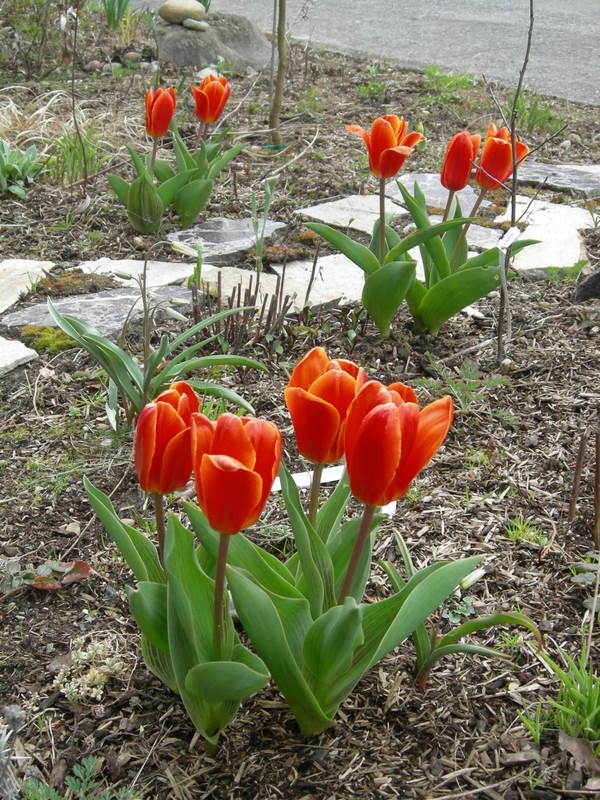 The tulips are starting to get a little frowsy, but they’ve been the only think blooming out there for weeks so they’ve done their job. Now spring really feels like it’s on they way, they can bid their farewell. Looks like I’m not the only one interested in blogging about strip gardens. For related posts, you can visit Raingardener at Gardening by Trial and Error and Susan at The Bicycle Garden (in Texas they call ’em hell strips – Susan also recently wrote most eloquently on the public spaces at the university where she teaches), and VP of Veg Plotting in the UK also has a meme going about public plantings. In a time of what seems like nearly constant bad news (war, economic instability, climate-change fears, environmental devastation, etc etc), it is easy to become misanthropic and feel like humans do nothing more than mess up the planet and fail to learn from history. Or, at least for me it is. On days when these feelings prevail, one remedy is to spend time in the garden. Somehow, the plants restore my faith in the world, at least for a while. Or at least they give me the renewal of hope that is necessary to dive back into the human fray and keep swimming. I’m betting I’m not the only one who uses their garden as therapy in this way. 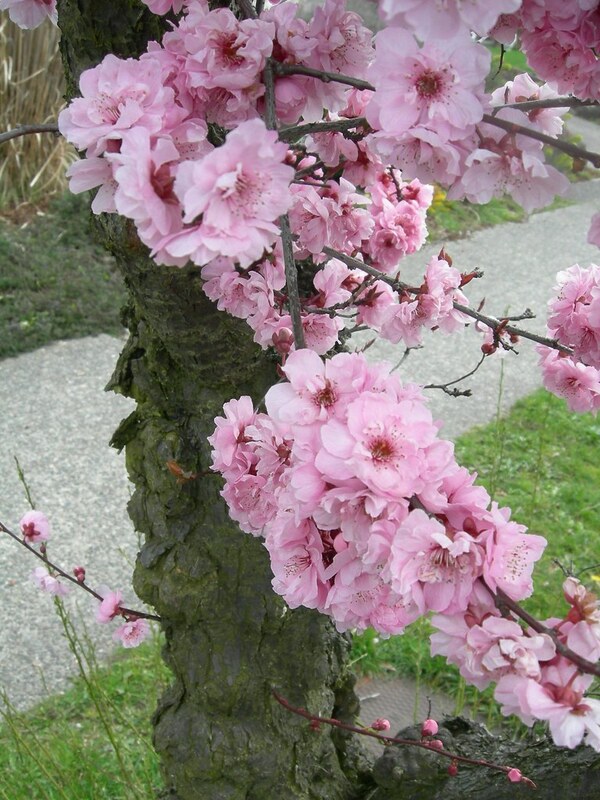 Another antidote to all the bad stuff, recently, has been the truly wonderful group of people that have come together as SAGBUTT (Seattle Area Garden Bloggers United To Talk – the joke name which seems to have stuck). As already so ably chronicled at Petunia’s Garden and Garden Muse (and probably elsewhere – I’m a bit behind in my blog reading this week), our most recent meeting was possibly even more fun than the initial one. Paula (aka Petunia) did an amazing job of organizing the event, which lasted 3 1/2 hrs. but seemed to go by in minutes. It was great to see folks returning from last month, plus it was lovely to put a few new faces to names, as in the case of Catherine of A Gardener in Progress, Bob from Bob’s Garden, and (the most un-curmudgeonly) Curmudgeon of Weed Whackin’ Wenches. Our special international honored guest, Matron of the UK’s Down on the Allotment, supplied a wealth of veggie-growing tips and a uniquely across-the-pond perspective, kindly taking time out from her visit with friend Debbie, who also attended. A lot of the chat was about seed-starting, never my forte, but it was fascinating to hear about everyone’s successes and struggles, and to learn of resources and suggestions in case if I ever get around to learning this valuable skill. Among the more exotic (to me) things mentioned – Bulgarian giant leeks, gym exercises for seedlings, purple podded peas, “a cabbage summer,” barley and rye grass for dogs’ digestion aids, and poached-egg flower. 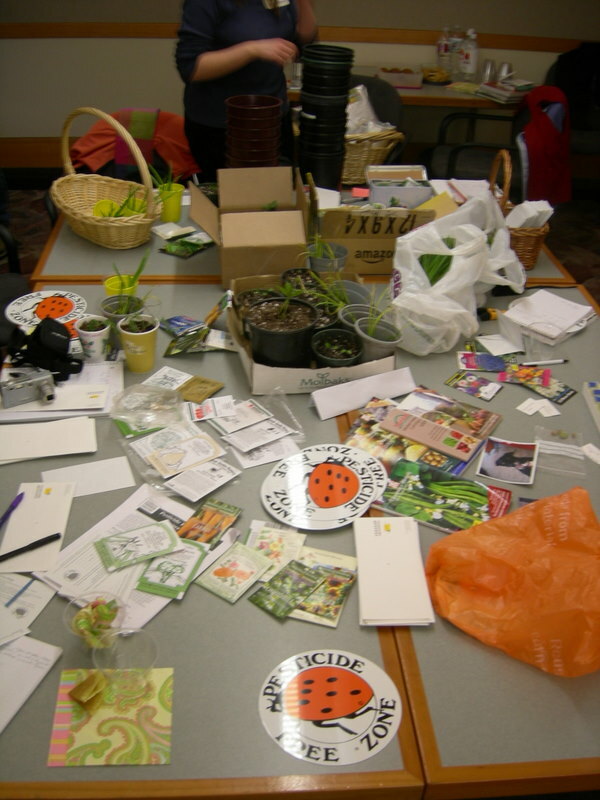 The seed and plant swap that followed was the most polite, careful exchange imaginable. Everyone made sure to only take what they thought they could use, asked others if they wanted something before nabbing the last of anything, and graciously thanked all donors. And the only person who wasn’t able to bring something along gave tantalizing descriptions of divisions to come next time – sedums, crocosmia, hardy geraniums, and perennial herbs, among other possibilities. Wow, I don’t want to miss that meeting! Curmudgeon graciously offered to “host” next time, April 18 (Earth Day!) at the Good Shepherd Center in Seattle. Details TBA at WWW soon. Oh, did you think I’d forget to say what I scored in the swap? Never fear. Thanks to everyone for all the swag and for notching my opinion of humanity a little higher this week. 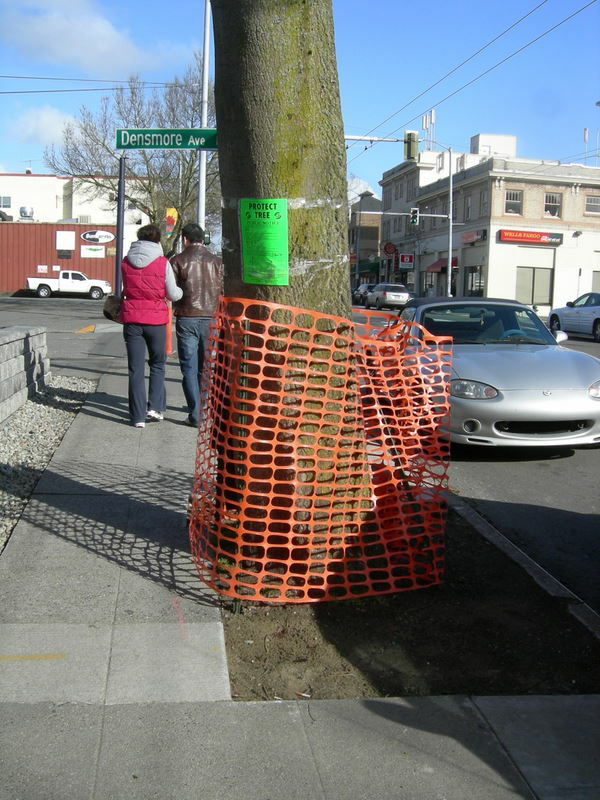 The City of Seattle is finally getting serious (I hope) about the decreasing canopy in town. 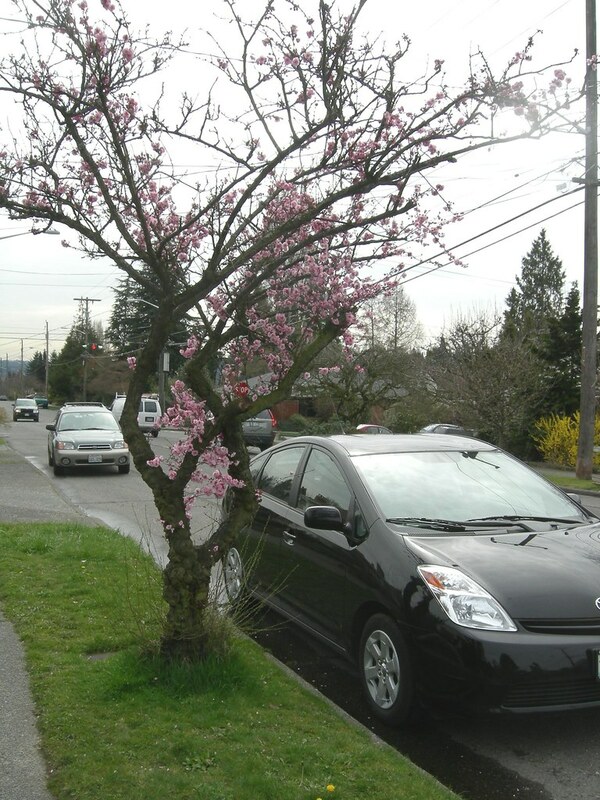 The recent explosion in development here recently probably made this inevitable, but we’re not planting trees fast enough to keep up with the losses and the street trees that are planted often are poorly cared for and don’t make it to maturity. So, I guess the big ones are going to have to be protected by threatening a big hit to construction companies’ pockets (“treble” the sum of $7,800, in this case, is nothing to sneeze at!). But how do you determine the worth of a tree? 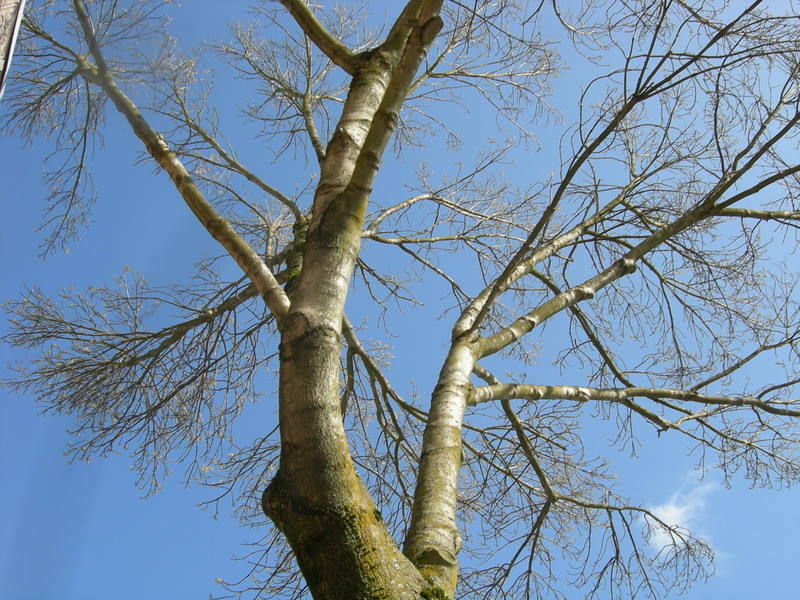 I’m sure they have their formulas – height, girth, estimated age, rarity of species, etc but what about the emotional value of a tree? Is it one that you’ve passed every day for years, or that you grew up climbing, or whose flowering branches you picnicked under? 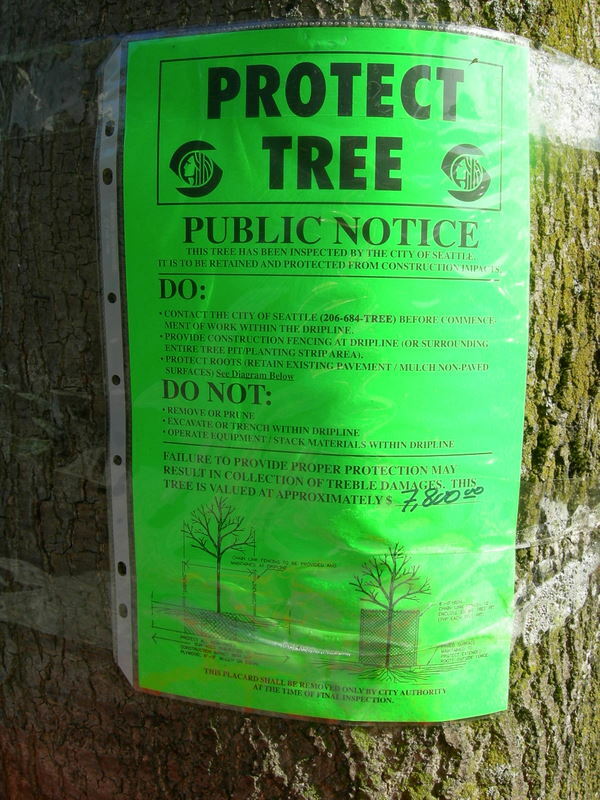 City street trees might not be likely to have so many associations of this kind, but I’m glad someone’s finally sticking up for them. How doyou determine the worth of a tree?